When we think of the great bass players in jazz, generative composer/leaders such as Charles Mingus and Charlie Haden, a distinctive approach and a distinctive sound come to mind. That's what happens when you mention the name of bassist, composer, and leader Michael Bisio. The critics, out in front for once, already know about Michael. His second album as a leader, In Seattle (Silkheart), made the Village Voice "Best Jazz Records of the 1980's," as well as critic Kevin Whitehead's 1988 Top 10 for National Public Radio. The Penguin Guide to Jazz described In Seattle as "an exemplary instance of the kind of contemporary jazz being created away from the principal American centres." And Paul de Barros, in his Northwest regional jazz history, Jackson Street After Hours, singled out Bisio as one of the preeminent heirs to Seattle's earthy, yet innovative, tradition. First and foremost, Bisio is an artist. "It actually took me a while to figure this out," confesses the emotionally intense, articulate bassist, who came to Seattle in 1976 from his home town of Troy, New York. "I mean, it's one thing to be a professional musician. Which I am. I've made my living playing this music since I was in college. But it's another thing to think of yourself as a professional artist. You make different decisions." What that has meant for Michael is taking time to develop his own music as a leader and composer, where others might have concentrated on how to get to the next casual gig. Though it has been a struggle, this attention to detail and passion for purity has paid off. In a flurry of activity over the last ten years, Bisio has played and/or recorded with Barbara Donald, Wayne Horvitz, Bob Nell, Andrew Hill, Sonny Simmons, John Tchicai, Bern Nix, Jim Nolet, Joe McPhee, Vinny Golia, Van Manakas, Greg Bendian, Carter Jefferson, Charles Gayle, and Marilyn Crispell. He has crossed the country twice with Gayle and toured the West Coast with his own quartet. What these noted leaders all find in Bisio is a gutsy, honest style and what the poet Garcia Lorca called duende, best translated as soul, or heart. His sound recalls the reverent and warm melodicism of Charlie Haden. Like Haden, he uses gut strings and mikes his bass directly, with no electronic mediation. But Bisio also has no problem venturing "out" into the textural energy zones defined by "new thing" jazzers in the 1960's. As a composer, his work is marked by a spare, bluesy sound, the sweet-and-sour timbres favored by Charles Mingus. Former Down Beat editor Art Lange, upon hearing Michael at the 1994 Du Maurier Jazz Festival, remarked: "Bisio's wailing arco bass was reminiscent of David Izenzon with Ornette Coleman." That was a good call. Like Izenzon, Bisio is one of those wild and wooly guys of the edge who also has a rock-solid musical foundation. Bisio began his life behind the big violin with David Cobb, Professor of Bass at the State University of New York at Albany (SUNYA), winning scholarships to the Congress of Strings and the Chautauqua Institute of Fine Arts, then went on to earn a Bachelor of Music degree from the University of Washington (UW), in 1979, where he studied under Seattle Symphony Orchestra bassist James Harnett. At the UW Bisio played jazz, classical, and new music, the latter with the Contemporary Group, co-led by William O. Smith (aka Bill Smith, clarinetist with Dave Brubeck), and trombonist Stuart Dempster. A fine and sensitive reader, like Wynton Marsalis, Bisio can cut it with the classical cats. For many years, he subbed and toured with the Northwest Chamber Orchestra, Seattle Symphony, Pacific Northwest Ballet, and Royal Winnipeg Ballet. It was in the 1980's that Michael began making his mark in jazz, as a part of a nexus of open-eared, soulful, deep-in-the-tradition Northwest jazzers that includes Bob Nell, Barbara Donald, Jack Walrath, and Bert Wilson. Donald, the fiery trumpet player whose '60's recordings with Sonny Simmons had made her a legend, noticed Bisio first, using him on gigs for six years and on her comeback recording, The Past and Tomorrow (Cadence, 1983). In the meantime, Bisio organized his own quintet with Montana-based pianist Bob Nell, saxophonist Rick Mandyck, drummer John Bishop, trumpeter Ron Soderstrom and violinist/pianist Beth Chandler. In 1983, they made an auspicious debut recording, Ours (CT Records). Cadence editor Bob Rusch picked Ours as an Editor's Choice for the year, while the magazine interviewer, Alan Bargebuhr, wrote: "I was unprepared for the power and beauty of this disc." Paul de Barros said, "This is the best album to come out of Seattle in ages - tough, committed jazz, executed with assurance and authority." As Michael's reputation grew in the Northwest, he was chosen as Artist in Residence by the Washington State Arts Commission and recruited for the first concert series ever presented by Seattle's now well-known non-profit organization, Earshot Jazz. In 1986, Bisio began rehearsing a pianoless quartet, with Soderstrom, Mandyck, and drummer Teo Sutton. 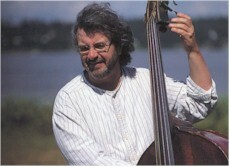 Their 1987 CD, In Seattle, issued on the Swedish Silkheart label, established Bisio's reputation internationally as a composer and player who bridged the gap between "inside" and "outside." In Seattle was a runaway success. Lee Jeske picked it as a "Jazz Feature" for Cash Box, and Cadence, Coda and the Village Voice all praised it highly, as well. Bisio had begun to be noticed. Not long after In Seattle, Bisio's quartet dissolved, and a period of great scuffling ensued. the bassist picked up some classical gigs, and worked with the great ex-Count Basie bassist Buddy Catlett, who had started a group in which he returned to his original reed instruments. Bisio also worked during this period in a fine piano trio led by Wayne Horvitz, who had recently moved from New York to Seattle, and with Horvitz's New York Composer's Orchestra West. A highlight of 1990 was a commissioned performance by the International Creative Music Orchestra, at Seattle's Earshot Jazz Festival, with Horvitz, Andrew Cyrille, Larry Ochs, and other musicians from around the world. A call from the fierce improvising reed man Charles Gayle in 1993 led to an enthusiastically received West Coast tour of the Charles Gayle Trio and a subsequent criss-cross of the country. 1994 found Michael Bisio performing in Seattle with Bern Nix and Jim Nolet at the Earshot World Jazz Festival; in a new group with Northwest musicians Bob Nell (piano), Eyvind Kang (violin), Rob Blakeslee (trumpet), and Ed Pias (drums); and with New York drummer Phil Haynes on a variety of gigs at the du Maurier Jazz Festival, backing up Marilyn Crispell, John Tchicai, Glenna Powrie, Charles Gayle, and others. Both John Corbett, writing for Wire magazine, and Kevin Whitehead, reviewing for Coda, praised Bisio for his versatility and sensitivity there. In 1995, Bisio's abundant talent was recognized by Artist Trust, a Washington state arts support organization, which awarded him a GAP grant, and by the Jack Straw Foundation, which gave him an award through its Artist Support Program. On September 20, 1996, Michael was invited to perform in a concert celebrating Albert Ayler's 60th birthday at the Washington Square Church in New York City. He played there in a quartet with Joe McPhee, Jim Nolet, and Deidre Murray; and in the finale with Joseph Jarman, Amiri Baraka, Joe McPhee, Jim Nolet, and Sunny Murray. A 1996 Golden Ear Award was presented by Earshot Jazz to Michael for Best Northwest Jazz Recording for his CD Covert Choreography, by the Michael Bisio Quintet. That same year the quintet performed at the du Maurier Jazz Festival, to rave reviews. 1997 found Michael returning to the du Maurier festival, this time in a duo format with violinist Eyvind Kang. "The string duo charmed a packed house with an endless stream of melodies and improvisations," wrote Phillip McNally in Earshot Jazz. In July of 1997, Michael toured the east coast with jazz legend Joe McPhee. This was a totally inspired, critically acclaimed trip based on the strength of their duo recording for CIMP, Finger Wigglers. A Seattle concert later that year would earn a 1997 Golden Ear Award for Concert of the Year, and a place, the fourth of ten concerts chosen, in Paul DeBarros' "Jazz Inside Out: Best Sounds of '97" article for the Seattle Times. July of '98 saw Michael and Joe recording their second duo disc for CIMP. Zebulon was released early in 1999. Michael was also awarded a GAP grant through Artist Trust to record with Eyvind Kang. Today, Michael Bisio continues to tour and compose music for solo, duo, trio, and quartet. One of a long line of bassists to thrive in the Northwest - Glen Moore, David Friesen, Buddy Catlett, Freddy Schreiber, and Gary Peacock are a few of the others - Bisio is living up to all the expectations. Michael Bisio recently made his debut on OmniTone with the album Undulations.